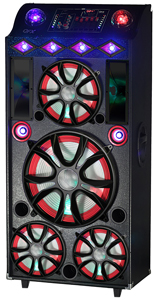 QFX’s Bluetooth/NFC Cabinet Speaker not only streams your favorite songs wirelessly with Bluetooth/NFC pairing, but also includes USB/SD playback/recording and an FM tuner. Customize your playback with a 5-band graphic equalizer and remote control. Connect like a pro with a ¼” Mic input, an RCA input, and a guitar jack. 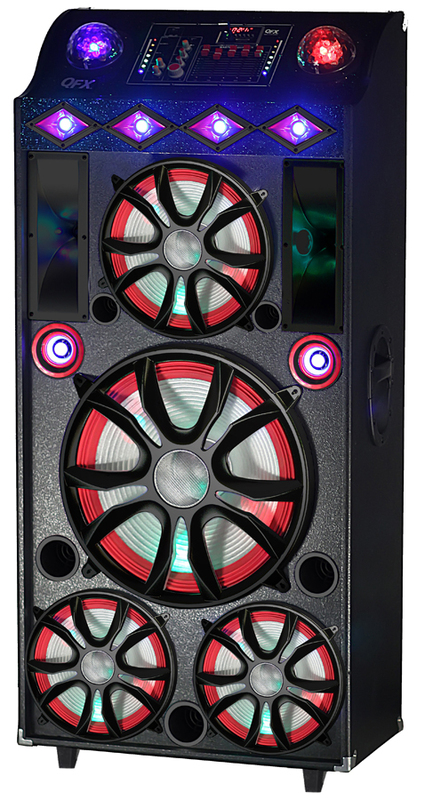 The 12", 18”, and dual 10" woofers and six 1” tweeters blast 15,000W PMPO of raw music power while the RGB LED-lit speakers and disco lights dance to the beat.